This article is the third in a series being written to assist the workshop technician in the development of electrical and electronic diagnostic skills; the previous articles being ‘Essential electrical skills’ and ‘Multiplex’. A thorough understanding of the two-part ‘Essential electrical skills’ is as the title suggests, essential in order to get the most out of this article and those to follow. ABS will be covered in three parts – principles, systems and diagnostics. In part 2 to this article we discussed the physical layouts of typical ABS systems and listed the main components/assemblies and their tasks. What follows describes the function and operating principles of these components and the system as a whole. Let us now study the components/system in more detail. The majority of ABS sensors detect wheel speed using an electrical process known as “inductance”. These inductive sensors are effectively small electrical generators, operating in a similar fashion to an alternator. A voltage is generated in a wire when a magnetic field is moved or changed in strength whilst in close proximity to the wire. The sensor consists of a sealed casing containing a permanent magnet and a coil of wire, the ends of which (output signal) are connected to the ABS ECU. The sensor is located in a bracket in close proximity to a sensor rotor mounted on a driveshaft, hub, or final drive crown wheel; in fact, anything that rotates at a speed proportionate to the wheel speed will suffice. The sensor rotor is a series of teeth (30 to 50 is the norm), which influence the magnetic field surrounding the tip of the sensor. The changing distance between the peaks and troughs of the sensor rotor teeth and the sensor influences the magnetic field – the magnetic field is influenced in a positive way by the metal construction of the rotor tooth (stronger) and in a negative way by the air in between the teeth (weaker), making it alternately strong and weak. This change in strength changes the voltage generated in the sensor coil. The picture above shows this effect. It can be seen in this example that the sensor rotor has only 4 teeth – this configuration actually represents an engine position sensor whose operating principle is identical to that of an ABS wheel speed sensor. In the diagram it can be seen that in the ‘yellow’ position the voltage generated is zero. This is because the sensor rotor tooth is as physically near to the sensor as is possible so the magnetic field strength has reached a maximum value. If it is at a maximum, it is not changing in strength and therefore no voltage is produced. The same rule applies in the ‘black’ position – the magnetic field strength is at its weakest and therefore not changing in strength – no voltage generated. When the ABS ECU receives a sensor signal, it uses it to determine individual wheel speed. When more than one wheel speed sensor signal is available to the ECU it can compare the speeds to decide if one or more wheels are in danger of locking up, causing skidding. The ECU has to convert the A/C analogue signal into a digital signal, because computers can only work with digital information in order to compare the wheel speeds with programmed values and other signals (brake switch etc.). This process allows the ECU to make decisions about the relative speeds of the road wheels. Note: some recent wheel speed sensors produce a digital signal. This type of signal often needs less processing power in the ECU as it requires no conversion. The actuator assembly consists mainly of a series of electrically operated solenoid valves to control the hydraulic pressure within the brake lines. In some versions, each hydraulic circuit uses solenoid valves that can be controlled in any one of three positions. Each valve assembly has two ball valves separated by a spring within a cylinder and the two valves can move semi-independently. The upper valve opens/closes the port from the master cylinder and the lower valve opens/closes the port to the wheel cylinder, as well as a port to a reservoir (see diagram). During normal braking the pressure on the pedal is increased by the driver. The solenoid valve is inactive and brake fluid is forced past the upper ball valve into the wheel cylinders/callipers. This is known as the pressure increase phase. If the if the driver continues to increase the pressure on the brake pedal, eventually one or more of the wheels will be at risk of locking. The ECU will sense that a wheel is rotating much slower than it should be at that particular road speed and intervene. 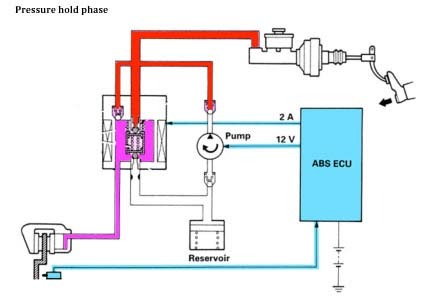 A low current signal is sent to the solenoid valve of the slow wheel, moving the valve upwards to block the hydraulic pipe from the master cylinder. The pressure produced up to this point at the wheel brake is maintained (held) at that level. The driver now has little further influence on the brake pressure, almost regardless of how hard the pedal is pressed. The pump runs in preparation for the next part of the sequence (note that the pump is housed in the modulator assembly itself). In this condition, the wheel speed should be maintained at a point just before the onset of skidding, proportionate to vehicle speed, so providing maximum deceleration. This is the pressure hold phase. Unfortunately, a number of factors may still cause the wheel to slow excessively and skid. 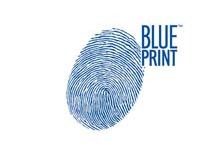 Amongst others, variations in road surface and brake lining grip levels, surface irregularities; loads during cornering and changes in pressure applied by the driver all conspire to allow the wheel to lock, causing vehicle instability. Further measures must be taken to prevent this effect. 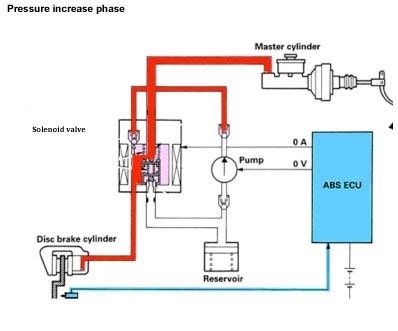 Should the ECU detect that the wheel is slowing too much, a high current signal is sent to the solenoid valve in the affected wheel’s hydraulic circuit. The higher current lifts the lower ball valve off its seat against spring pressure, allowing fluid to flow from the wheel cylinder into the reservoir (note that the reservoir is also housed within the modulator). The release of brake pressure allows the wheel to speed up again, regaining grip. The pump is running to return fluid to the master cylinder, pushing against the driver input and possibly causing the pedal to rise slightly. This is the pressure reduction phase. Depending on how much the wheel speeds up during the pressure release phase, the ECU reverts to the earlier pressure hold or increase phase. Should the wheel attempt to lock again, the cycle is repeated. This can occur many times per second and the resulting high frequency pressure variations are usually felt at the brake pedal as vibration, in some cases causing the inexperienced driver to remove their foot from the pedal with disastrous consequences! 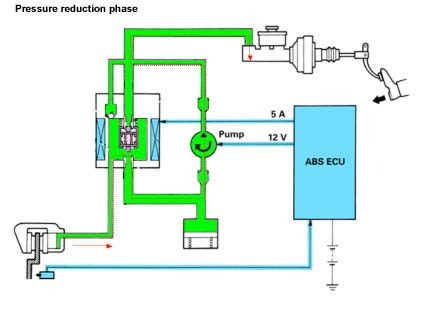 In this article we have seen how the wheel speed sensors actually generate signals and how the three-position solenoid valve type ABS modulator controls hydraulic braking pressure. We will be going on to describe another common type of actuator in the next article. If you would like to study anti-lock braking systems in more detail we would be delighted to provide you with a place on one of our technical courses. Please see details below on how to contact us.